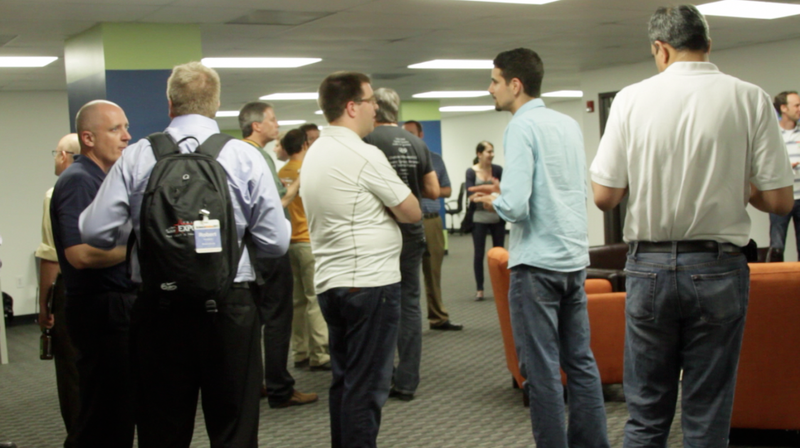 Over 50 people experienced the fourth Charlotte Startup Weekend earlier this month. You can get a flavor for the event via Bridget Sullivan’s coverage of our pitch session and demos. Brett Bumeter published playlists of all our pitches as well as his chats with each team about the tools they used during their mad sprint to the finish. Our first-time participants, new volunteers, sponsors, and judges helped expand our event’s horizons yet again. Our winner was a mobile audio game named Dog Dash. As a result, they’ll be enjoying memberships in BIG and RevTech Labs. Our runner-up, StockFel, will receive membership in Queen City Forward, showing our entrepreneurial base includes social entrepreneurs as well. We are early in the planning process for the next Startup Weekend event, but you can be assured you’ll read about it here! I’ve been a member of BIG myself for a couple of years now, and it’s easy to identify the experience of its members as one of the principal sources of value in the community. Another BIG member, Don Minges, gave a strong recommendation to read 6 Secrets, and I complied. It was interesting for me to see names that I had only seen on name badges featured in a book– much less one with plenty of meaningful thought on creating business. John Bradberry will be covering his findings at the Ben Craig Center (soon to be Ventureprise) in early June. The book covers a range of different businesses, and while each faces its own particular challenges, it’s remarkable how the same fundamentals show up over and over again. Register online to hear more of Bradberry’s experiences in Charlotte startups. The ability to connect with the author and original sources is a great bonus for entrepreneurship here! I am a big believer in the power of local and regional conferences to connect all those professionally minded. These conferences can be of particular benefit to software developers. Instead of the usual experience of having few strangers understand what you do, there is a powerful effect when you can not only share common interest areas but also use discussion to hone your practices and craft. Drupal and Linux are both very popular open-source platforms, and regional conferences in the open-source world deliver the best experience for attendees possible. Because open-source communities are built on sharing, and a populace that is frequently dispersed geographically, it represents a great opportunity for these enthusiasts to get together for low-latency conversation. Expect acolytes to converge on Charlotte in early June, especially with the price tag! By registering for the full conference, you can hear a variety of presentations on the state of the Linux universe. By registering for Drupal Camp Charlotte, you can literally become a part of the program because of its unconference format. Bryan Stalcup, Mark Shropshire, Scott Lundgren and many other Charlotteans will be involved in the volunteer efforts to put on these events, and you should consider registering. TechCrunch is coming to Charlotte, at least in part, based on the likes you gave on a comment of mine a few weeks ago. You can RSVP for the July 11 event now, and I hope to see you there. On April 12, Chris Granger decided to publicize an idea called Light Table in an attempt to draw funding. Instead of turning to finance, however, he took a prototype to his prospective customers: other software developers with a desire for better tools. He had hoped to raise $200,000 to create his vision of a better environment for producing code, and on May 12, his hopes were affirmed . To date, 5,746 software developers have reviewed Light Table and found it inspiring enough to open their pockets and pay for a piece of software that has not yet been written. In part because of this market validation, Light Table received the great honor of acceptance into the Summer 2012 Y! Combinator program. Five years removed from his graduation at UNC Chapel Hill, Granger pledges to build the software according to principals stated on the website, and to open source the results when the work is complete. After the software is deemed ready for use and released, the integrated development environment (or IDE) will become “donation ware:” free to those who cannot or will not pay, but accepting of gratuity. Apart from being another chapter in the continually fascinating relationship between open-source software and market forces, Light Table also represents an opportunity to reflect on our progress as a business and technology community. Although he now lives in San Francisco, Chris Granger worked in Charlotte during 2008 and 2009 for Skookum. We still here in the city wish Chris the best, and set ourselves to work towards a day when such talents (and there have been several) do not need to leave the city to pursue their dreams and explore their capabilities. I frequently receive requests to help solo entrepreneurs find a technical cofounder. For these reasons and others, this can be a difficult request to fulfill. Not only is software development expertise commanding a significant premium these days, but also many great engineers do not make great co-founders. Even further, business partnerships are in many ways as difficult to arrange as personal ones. That said, the process is important. A cohesive founder group is one of the most meaningful assets a young company can have. I think it might be fun to try to get a team with a known model for getting founders together involved here. Founder Dating recently announced a campaign to add more cities to its network. Why not apply to unlock Charlotte as a city or check how we’re doing? While the days of WebVan are a distant memory, one Charlotte start-up is giving the idea of purchasing groceries over the Internet for home delivery another a try. Pineville-based Lettuce Carry has 15,000 items available for home delivery to much of the Charlotte metro and parts of South Carolina. They report that they have about 50 customers, so give them a try and see if you can help them make it. Let me know if you do, and how you liked it! The Council for Entreprenurial Development has named its 25 companies to watch in 2012, and three Charlotte companies made the list. Argand Energy Solutions, Smarter Systems, and The Mother Earth Group, Inc. show the breadth of startup activity here, representing solar energy, connected and interactive devices, and a farm-to-table restaurant concept. Congratulations to our winners! Charlotte, NC was one of three North Carolina cities nominated for Beer City USA 2012, along with Raleigh and the winner Asheville. We were destroyed in the voting, but in this case the old adage holds true: it was an honor to be nominated. With Olde Mecklenburg Brewery leading the way to market, many other local breweries are following in their path by getting distribution throughout Charlotte. When you visit your next bar, ask if they have beers brewed here in Charlotte and give one a try!